This page gives a detailed technical explanation of why certain issues affect Subversion users. In actual fact, the branches drop-down menu shows only branch names. It does not show tags, but in some instances Fisheye will synthesize a branch name to record certain operations. To understand how this occurs, you will need some background knowledge on Subversion tagging (introduced in the following segments of this page). In Subversion, tags are only a convention and are typically the result of a copy operation from the trunk to a tag area in the tags directory. When Fisheye processes this copy operation, it recognizes that the destination is a tag directory and tags the source file on trunk with the name of the tag. That is, Fisheye is interpreting the Subversion copy to a tag directory as a tagging operation on the trunk files. For regular changes in your Subversion repository, Fisheye records each change against a branch where the change took place. If, however, after tagging, you make a change to a file in the tagged area, you are making a change outside trunk or a recognized branch. Fisheye records such changes by creating an artificial branch name and associating that branch name with the change. The branch name is derived from the tag name by prepending "tag:" (in other words, the characters "tag:" appear as the first part of the name). The same thing will occur if you create a new file in the tagged area which does not come from an existing branch or trunk. 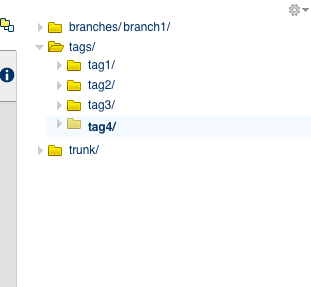 This is the reason you see some of your tags in the branch drop down. It means that for those tags, you have made a modification after the tagging operation. There are two changes here. The first creates the tag and the second adds a new file in the tagged area. 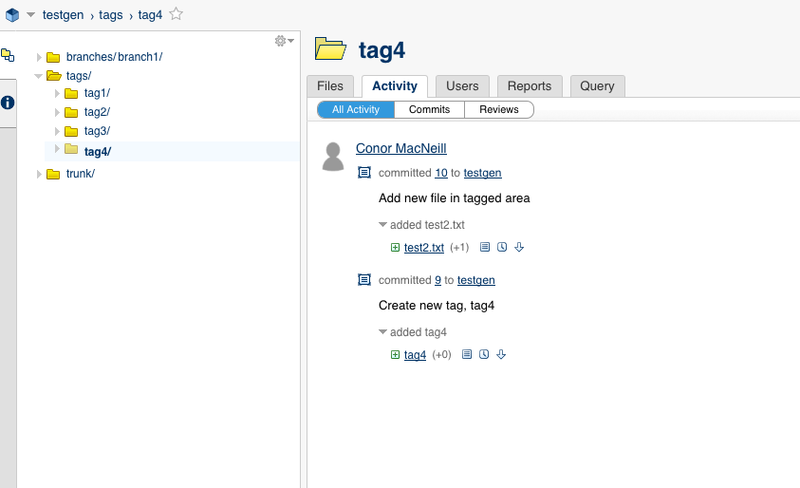 This will result in the creation of an artificial branch, called "tag:tag4" within Fisheye. In general, it's not good practice to make changes in the tag areas of a Subversion repository. Such changes can easily get lost if they are not applied to trunk or a current branch. It is preferable to make the change in trunk or a branch and then create a new tag to capture the update. Nevertheless, since Subversion tagging is merely a convention, this is sometimes convenient. Fisheye handles this situation as described above. In general a lot of systems have a large number of tags which would make the drop-down unworkable. This is the reason the tag field is a text-entry box below the branch drop-down menu in Fisheye. If you want to constrain to a tag, enter the tag name in the tag field of the constraint filter.